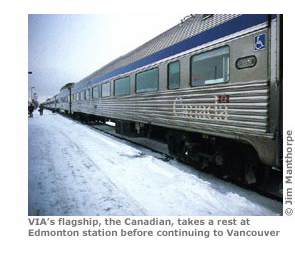 Canada’s transcontinental through service is operated by VIA Rail (the national passenger rail network) three times a week between Toronto and Vancouver. You can take connecting trains to extend or alter your route in several ways. For a start, if you want to make it a truly transcontinental journey from coast to coast, you can begin or end it in Halifax on the Atlantic. Alternatively you can make Montreal or Quebec City the eastern terminus of your trip. Another option is to start or end in Prince Rupert on the Pacific instead of Vancouver; this is very popular with travellers who want to combine their rail trip with the Inside Passage ferry ride between Prince Rupert and Vancouver Island. Finally, if you’re short of time you may choose to do not the whole trans-Canada trip but only a portion of it, such as the scenic leg between Jasper and Vancouver. Once you’ve chosen your route, the next thing to decide is in which direction to do it. By and large you see the same scenery whichever direction you travel in, though on some services the eastbound and westbound trains travel through slightly different sections of the journey at night. There’s no doubt that the approach to the Rocky Mountains is far more dramatic from the prairies than from the Pacific. Furthermore, if you’re interested in charting Canada’s history on your rail trip, travelling from east to west follows the direction of railway development and settlement across the country. It’s worth noting, however, that westbound trains get booked up far earlier than eastbound trains. Few people want to spend their entire holiday sitting on a train; fortunately, the railway takes you through some superb cities where you can break up your journey. Some of the best, notably Vancouver, Toronto and Montreal, are conveniently located at the beginning or end of a line, so spending time there is no problem as far as your ticket’s concerned. In addition, all VIA Rail tickets include one free stopover per journey, which can be for as many days as you wish. The single most compelling stop on The Canadian is undoubtedly Jasper, in the heart of the Rocky Mountains. If you want to make more than one break you need to buy either separate tickets, which works out more expensive than a through ticket, or a rail pass (see box opposite), which allows unlimited stops within a given time period. In this case, Winnipeg makes a good place to stop off, being right in the middle of the county – though some travellers find Edmonton more appealing. If you’re travelling on The Ocean (Halifax–Montreal), you should try to stop off at Quebec City (served by Charny station), perhaps the most beautiful city in Canada. The daylight-only Skeena has an obligatory overnight stop at Prince George, with no other stops allowed on a through ticket. The overall cost of a rail trip across Canada can vary enormously, depending mainly on when you go, how many nights you spend off the train (and the kind of accommodation you choose to stay in), the length of your rail journey, the type of ticket you buy and how you get to Canada; see p11 for details on how to book your ticket and take advantage of the many discounts and special fares on offer. There are several major expenses to consider, including travel to and from Canada, train tickets within Canada, accommodation and day-to-day living. The first is getting to Canada; the exact price of this depends on where you are coming from, of course, but for those heading from outside North America it will probably be a significant portion of your overall budget. From the UK, expect to pay from around £300 (low season) or from £550 (summer) flying into Toronto and out of Vancouver; and from £600 (summer) into Halifax and out of Vancouver. For more on flights, see pp25-6. Note that if you’re on a package your flights should be included. The box on p11 has some useful advice on obtaining discount tickets but, even if you do manage to secure the cheapest possible tickets you are still looking at a fairly hefty sum. From Halifax to Vancouver, the cheapest fare would be with a Canrail Pass for $588 (plus 13% tax) during the off-peak season, and $941 (ditto) at peak period. Sleeper class tickets on this route would cost from around $700 off-peak, and from $1250 during peak period. Prices are nearly always per room rather than per person, with most doubles only a few dollars more expensive than singles. This makes travelling in a pair extremely good value but lone travellers can end up feeling rather hard done by. Bear in mind that room rates are often quoted before taxes are added on (typically an extra 13% – see p54). Upmarket hotels tend to offer exceptionally good value compared to their European counterparts, with rooms going from around $240 – just $120 (about £70) each if there are two of you. Note that it’s usually cheaper to stay in these places at weekends, since weekday ‘rack rates’ are designed with business travellers in mind – and the cheapest deals are usually available only online. Typical mid-range accommodation will give you a double with a private bathroom for around $80-130, though prices can vary significantly depending on location and the general state of the place. Budget travellers can count on paying about $25 for a youth hostel bed in the smaller cities and about $28 in the bigger places (more for non-members). Single rooms in university residences usually cost around $50-60, with discounts normally given to students. When you add the cost of accommodation to these prices, it can sometimes work out cheaper to get a package deal, particularly if you plan to stay in upmarket hotels. In the UK, packages start at around £1600 for a two-week trip in the low season, including flights into Toronto and out of Vancouver, the rail journey between the two, and all hotel accommodation. This price is closer to £3000 in the peak season, going up around £4000 for the more expensive luxury holidays. In the US and Canada, trans-Canada packages start at around $2000 (note all prices quoted are in Canadian dollars) for ten days out of season (and from around $3400 in peak season), and usually exclude the cost of transport to and from Toronto and Vancouver (or alternative start/end points). We list selected UK rail tour companies on p26, and Canadian companies on p28. Corny as it may sound, Canada is beautiful in every season. Autumn is a tourist attraction in itself as the country’s forests turn into a glorious blaze of reds and golds, especially in eastern Canada. In winter the snow-covered landscapes are dazzling, but best experienced from the comfort of a train; you have to be pretty hardy to cope with sightseeing in sub-zero temperatures. Canadians, like hedgehogs, tend to hibernate in these cold months so city centres can be depressingly empty. Spring is lovely in Canada (as spring usually is anywhere) with May temperatures averaging 13-15°C/55-59°F in most cities. The warmest and sunniest months are July and August when temperatures average around 25°C/80°F in places on the line. Of course, there’s more than the weather to take into account in deciding when to go. An important consideration is the cost of the trip: rail fares and hotel rates are considerably cheaper out of the tourist season (with off-season generally considered to be between October/November and April). It’s also much easier to get train reservations in the quieter months, whereas peak period sleeper tickets should be booked five to six months in advance. Something else to bear in mind is the number of fellow tourists you can expect to be surrounded by on your visit: July and August are very, very busy, so if you’re going to Canada for its tranquillity and big empty spaces, give these months a miss. Canada is one of the easiest and most hassle-free countries in the world to travel in and arranging a trans-Canada rail trip is an extremely uncomplicated process. You can book your tickets online on VIA’s website from anywhere in the world, and collect them from your departure station on arrival in Canada (or arrange to have them sent to your home address). This is the best way to make a booking as you can see which discounted tickets are available on which dates of travel. Alternatively, if you don’t like the idea of booking online, VIA have a number of overseas booking agents (see box p27) who can make a reservation for you over the phone. Similarly, booking flights and accommodation is a much easier process than it once was, thanks to the internet. In light of this, it hardly seems worth taking a package tour, particularly as you can decide exactly how much time you want to spend where if you organize it yourself, whereas this decision will usually be taken for you on a tour. Moreover, independent travel invariably works out cheaper if you plan to stay in mid-range or budget accommodation. Where tours come into their own is if you want to stay in upmarket hotels. Many tour operators put you in luxurious establishments such as the former Canadian Pacific hotels now owned by Fairmont; they make block bookings which means they get big discounts, so you often end up paying less than if you booked the accommodation yourself. Escorted tours take most decision-making and the responsibility of getting from A to B out of your hands, which can be a good or a bad thing depending on what you’re after. Bear in mind, though, that the pace of some tours can be considerably more gruelling than that of independent travel as you will be whisked off on countless sightseeing trips in between your days on the train.